Designed using essentially beautiful “Gothic” architecture is the St Michael’s Cathedral located in Himachal Pardesh and built in 1886. This beautiful cathedral that can apparently house about 400 people during a service is situated in the city of Shimla, also known as “Queen of Hill stations”. Historically speaking, since this church building was under construction during reign of Viceroy Lord Rippon (1880-1884) it has also been commonly referred to as “Ripon Place”. Furthermore, this cathedral designed by Henry Irwin, the then Superintendent Engineer and Architect of Shimla is considered to be the first Roman Catholic Church to have been built in this picturesque hill station/city. If you intend to drive to St Michael’s Cathedral the starting points located in close proximity would be New Delhi, and Chandigarh. a. How to reach St Michael’s Cathedral from New Delhi : The shortest route to reach from St Michael’s Cathedral to New Delhi is via NH5 and NH 44 as depicted in the map above. Alternatively, click on the Google Maps link here to view on Google Maps. b. How to reach St Michael’s Cathedral from Chandigarh. : The fastest route from Chandigarh to St Michael’s Cathedral is via NH5 and the route map is depicted above. Alternatively, click on the Google Maps link here to view on Google Maps. The closest airport domestic to this temple is located in Shimla. The Jubbarhatti Airport is well connected to major cities in the country while, the nearest international airport is situated in New Delhi. According to history, this cathedral was first constructed in 1885 by Henry Irwin the then superintendent engineer and architect belonging the Public Works Department i.e. PWD. Apparently it was the then viceroy Lord Rippon who had just become a catholic who initiated the construction of this church. He was supported in his endeavour by people such as the then Lieutenant Governor of Punjab Sir Dennis Fitzpatrick. Furthermore, this church was then sanctified by the Archbishop of Agra thereby serving as a new diocese for Shimla as well as for the city of Chandigarh. 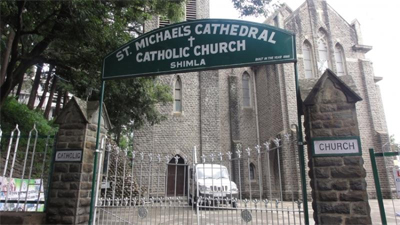 Click on the link here to check out the places to stay near St Michael’s Cathedral, Himachal Pradesh on Google Maps.